A combination of fund squeeze and political aversion has deprived lakhs of people from getting MGNREGS work, even though wages are very low. In MP, last year about 76.5 lakh persons demanded work as per official records but only 61 lakh were actually provided work. In other words, some 15.5 lakh persons – about one in five – were turned back, and asked to fend for themselves. Note also (in the chart), how demand has steadily risen since 2015-16. Yet, the number of those turned back has increased even faster. In Rajasthan, the same situation exists. Last year, nearly 77 lakh persons demanded work but just 65 lakh were actually provided. About 11.5 lakh or 15 per cent people were refused work. 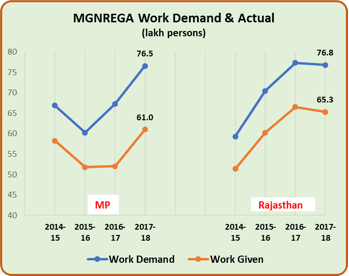 Demand for work has steadily risen in Rajasthan too. Remember: those seeking work in the programme are the poorest, most desperate people in the vast rural areas of both states, mostly hailing from agricultural labourer or marginal farmer families. They have no financial cushion, no social security, no savings or resources. That is why they seek work in the government-sponsored manual labour programme, as a last resort. 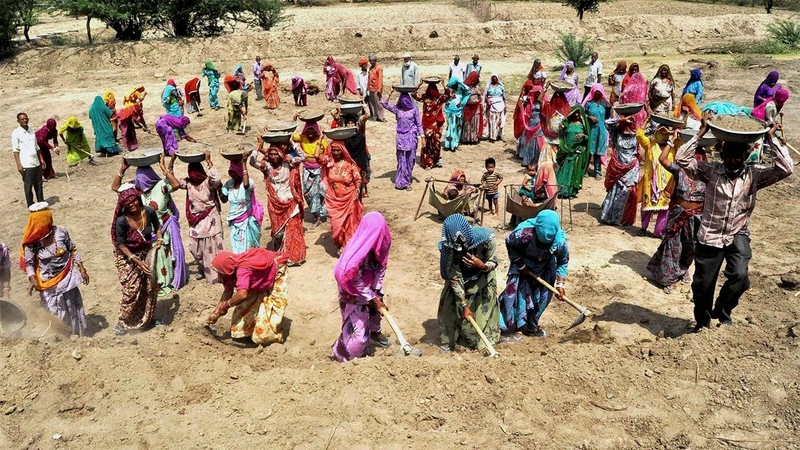 Both MP and Rajasthan governments, which have been boasting about their ease of doing business and investment opportunities for big business, and have set records in market borrowings, become perversely tight-fisted when it comes to spending on such key welfare programmes as the MGNREGS. 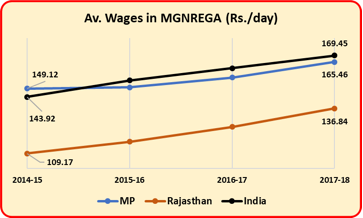 Chilling evidence for this can be seen from the chart below which shows average wages provided for MGNREGS work. Last year, both states were giving daily wages in MGNREGS work that were below the country average. Rajasthan has one of the lowest rates in the whole country at Rs.136.84 per day while MP doled out Rs.165.46 per day. The average for the country last year was Rs.169.45, itself a shameful level. Although, the law provides that work under the job guarantee scheme should be available for 100 days in a year, in MP, the average last year was just 47 days while in Rajasthan it was 53 days. In both states, payments are delayed inordinately, there are huge problems with the wage transfers to bank accounts, and Aadhaar-linked authentication. In fact, many experts feel that it is this electronic system that has caused most of the decline because intolerable delays discourage people from seeking work. Delays in transfer of funds from the central government, and further down the line by the state governments has also caused the crumbling of the job guarantee scheme. In the context of BJP’s promise of providing one crore jobs to people across the country, and follow up promises of various schemes like MUDRA (Micro Units Development and Refinance Agency), Skill India and Make in India creating jobs, the people of both states are disillusioned not just with their state governments, but also with the Modi-led government at the centre. This has been further compounded by the complete unwillingness of the Modi government to resolve the agrarian crisis that has been generated by diminishing returns for farmers for their produce and consequent indebtedness. Political pundits and pollsters are under-estimating the anger of the people with Modi’s betrayal. It will not be surprising if this political alienation of the people from Modi-led BJP becomes visible in the forthcoming elections. In March 2019, the Bharatiya Janata Party (BJP)-Indigenous People’s Front of Tripura (IPFT) completed one year in office in Tripura.